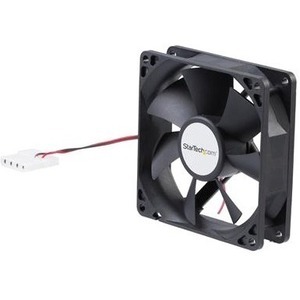 This 9.2cm x 9.2cm x 2.5cm (3 5/8" x 3 5/8" x 1") Dual Ball Bearing PC case fan is an add-in cooling fan designed to fit most computers. The PC Case fan can be used to circulate cool air into the case or exhaust warm air out, preventing problems due to overheating components. A quiet running brushless ball bearing DC motor coupled with a high efficiency blade design is capable of moving 39.35 CFM (cubic feet per minute) of air. Power is supplied to the fan using a standard LP4 (hard drive power connector) pass through plug.